I’ve been returning to the roots of writing practice lately. To the book I bought and cracked open as I was crossing the Georgia Strait between Tsawwassen and Vancouver Island on my way to Salt Spring Island, circa 1993. Back then, as I read the first pages of Writing Down the Bones by Natalie Goldberg, a pair of killer whales breached near the ferry’s wake. First published in 1986, the book pre-dates the Internet, and because of that, I’ve been finding it particularly useful. It’s helping me remember one of the fundamentals of a creative life that, these days, it’s too easy to fight against and try to remedy, assuming it’s an ailment that needs a cure in this age of constant connection. Sitting in a room by yourself, fishing around in your head for story, for the fix for that particular phrasing, for the oh-so-important answer to the question what does this character want? is all intense, solo work. And if we aren’t willing to go there, well, then nothing will get done. Lately, I’ve been remembering this because my aloneness is so much more obvious sans the salve of social media. Before, often, when I felt bored, uncertain, or, really, any other emotion, I’d readily turn to those “bright dings of pseudo-pleasure,” as Justin Rosenstein, co-inventor of the Facebook ‘like’ button, called the little thumbs up. These days, I don’t, and I feel different: calmer, more grounded, more connected to myself, definitely more connected with my writing, able to think more deeply. Living like this and re-reading Natalie Goldberg, considering what life was like before Facebook, Twitter, etcetera, I’m remembering who I used to be. Oh, yes, I’ve been thinking. I remember how this feels. I remember this particular trade-off: good work at the cost of isolation, at the cost of staying with discomfort, not bolting away. 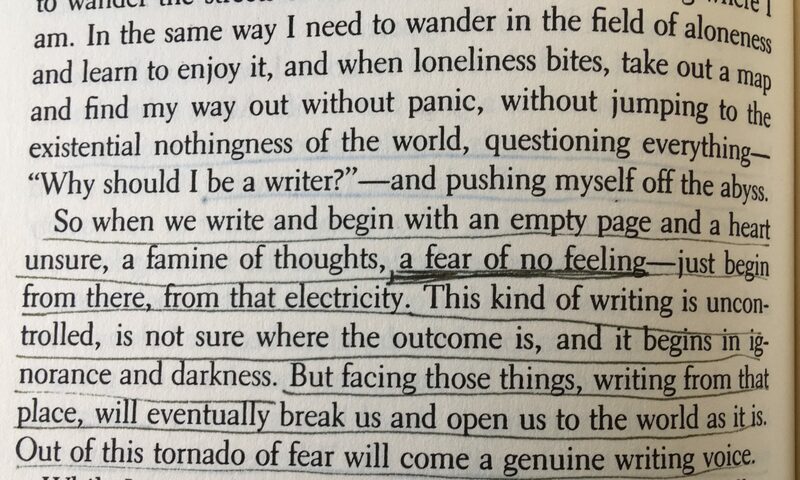 I took a picture of this because that’s me there, underlining vigorously, at the age of 20, knowing that feeling so well. 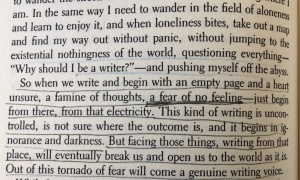 The fear of no feeling. Of emptiness. That you’ve got nothing to say. The famine of thoughts that haunts so many of us. That used to send me flinging myself into Facebook. Back when I was 20, that option didn’t exist. So, I’d pull out a pen. My journal. Follow her instructions: write anyway. And from there, that vacuum, that field of aloneness, some of the best stuff was birthed. I know this, I remember this, because that’s where I’m living these days, again. The option to bolt isn’t available. Of course, there’s another aspect to this. And that’s the thinking I’ve been doing about how I want my reality to look. Hint: not me as a weird hermit-writer, reliant on my dog with impulse-control issues and my husband as my sole means of immediate emotional support. But, rather, sharing time with an assortment of other humans – something that takes effort when you work from home and when you’ve moved to a new community. So, over the past few days, I’ve done some stuff: a felting workshop, dinner and a reading with a friend, and a writing session with a few other local writers in the quiet, peaceful living room of a hundred-year-old house. Wherever you’re at – Tweeting your heart out or a Luddite in a log cabin – I hope you’re doing what is best for you to stay attentive to the creative work you long to complete. (If you’re a subscriber, you’ll have already received the link to access the Zoom meeting. Another reminder, with the link, will arrive in your inbox on Sunday morning – and if you’re not a subscriber, sign up for my email list to get the information when it goes out this weekend! I’d love to have you on board!). One Response to Writing is lonely. But it’s worth it. The writing style of your article is very nice. Thanks for sharing it.